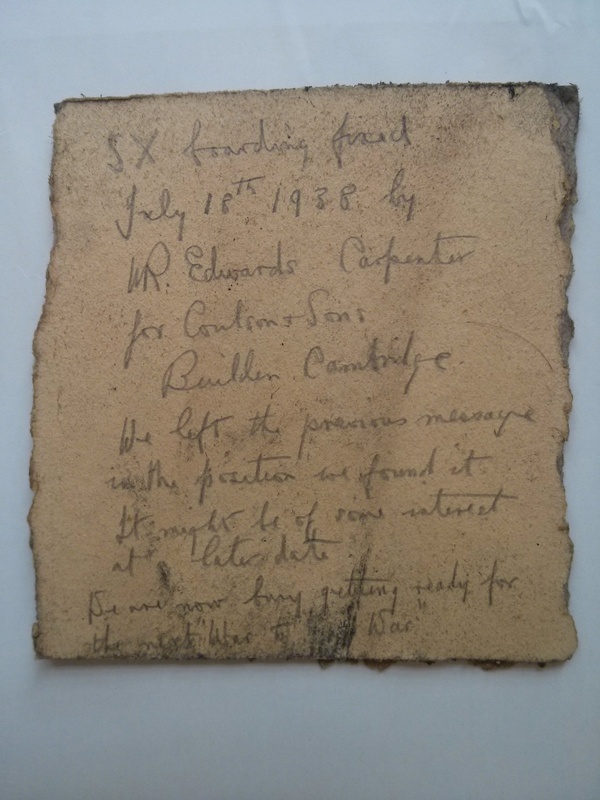 On 26 June, 2014 the College Works Department was refurbishing a room on G Staircase, Nevile’s Court, when they discovered these treasures from October 1914 behind the wall. The Staircase G finds as they were discovered behind the wall. This note seems to indicate that this was the room that housed the library for the First Eastern General Hospital while it was located at Trinity during the Autumn of 1914. The library was the result of an initiative by the librarians of Trinity, Magdalene and Corpus Christi Colleges, who ran a book and magazine drive to create a library for the soldiers while the hospital was located at Trinity. A Fellow of the College temporarily vacated his residence to house the books and around 50 newspapers were also donated daily to help keep the injured soldiers entertained during their stay. The workmen who refurbished the room after the hospital moved to its new location wrote this note and drew a small cartoon of “Kaiser Bill” before sealing it behind the wall. 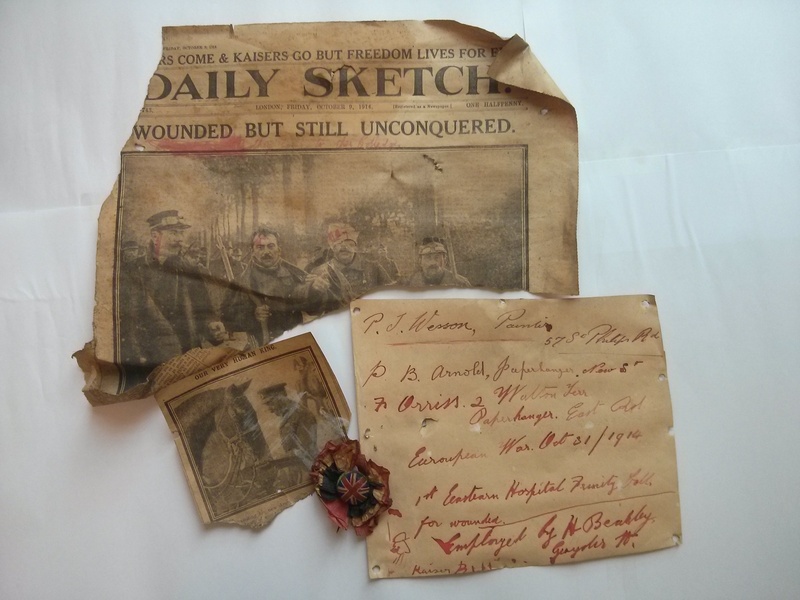 With it, they left a patriotic rosette pin and newspaper clippings from the 9 October edition of The Daily Sketch. The headline “WOUNDED BUT STILL UNCONQUERED” is followed by the hand-written note, “They came to this colledge [sic].” With a dose of gallows humour, the workmen added dabs of red paint to the photograph to look like blood on the wounded soldiers’ heads. 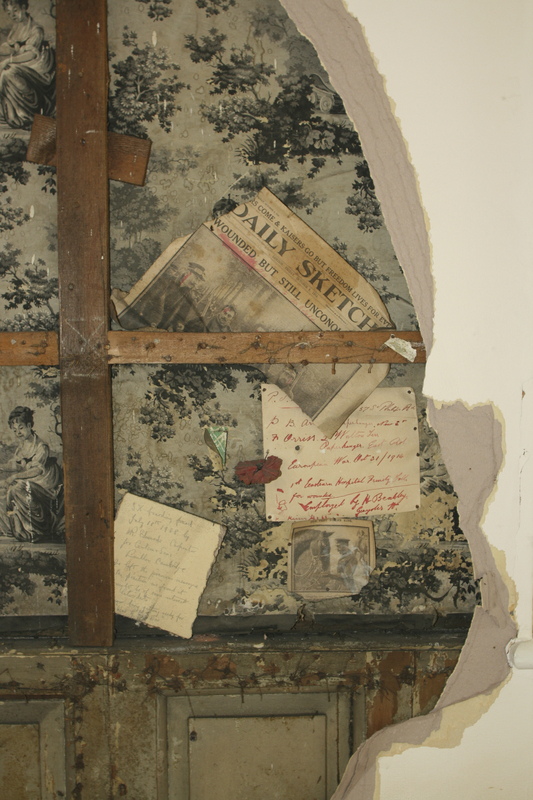 The artefacts were uncovered when the boarding in the room was repaired on 18 July, 1938 by W.R. Edwards, a carpenter for Coulson & Sons Builders. Edwards left these items where he found them, writing on a spare piece of board, “It might be of some interest at a later date.” He noted that while he worked, “We are now busy getting ready for the next ‘War to [End] War.’” Edwards could not have known how prescient his comment, written over a year before the invasion of Poland that precipitated WWII, would eventually be. It expresses a sense of irony that the workmen in 1914 did not have – a sort of cynicism that was more prevalent in the decades after the Great War. This touchingly human evidence tying the history of the College to the history of the First World War is on display in the Library’s exhibition marking the centenary of WWI. For more about the First Eastern General Hospital and more information about Trinity and the First World War, stay tuned to the Trinity College Library blog. UPDATE: The discovery was featured in The Cambridge News on 9 July, 2014.